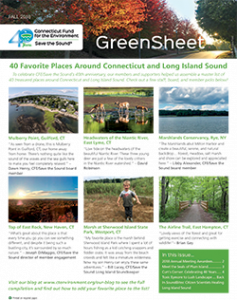 CFE/Save the Sound members stay well-informed with the quarterly GreenSheet/SoundBites newsletter. Each issue showcases local environmental victories that your support makes possible, and highlights pressing challenges your support has the power to help solve. Plus: upcoming events, volunteer profiles, and more! Click here to read the most recent issue. Head to our membership page to sign up for your copy and learn more about the benefits of supporting CFE/Save the Sound! Want to hear from us more often? Join our Email Network for event invitations, action opportunities, and updates on the projects you care about most.